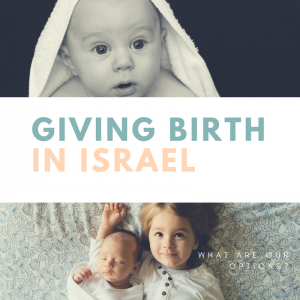 When we left off last week, I was just about to delve into the world of home births in Israel. Planned home birth is just that, planned. Meaning, the couple hires a home birth midwife, for about 4,000-7,000 NIS. That midwife conducts several prenatal visits, attends the birth, completes the Ministry of Interior registry of birth form, and examines the woman immediately and a few days after birth. 3. a woman who gives birth alone (with no one in attendance). Home birth is legal in Israel with a licensed RN (nurse) midwife and there are about a dozen home birth midwives practicing in Israel. In terms of rights, women who give birth at home and do not go to the hospital within six hours were not entitled to the ‘ma’anak leida’ or birth payment that women who delivered in the hospital were entitled. That is what this new law will change and now women do not have to go to the hospital to receive this payment. A woman can hire a gynecologist privately to deliver her in the hospital. That means that she pays the doctor a lump sum, (every doctor is different) and the doctor is called when the woman arrives and is in active labor. An important point to note is the doctor is responsible to be there at the delivery, not the labor, which means that your admittance and process in the delivery ward are the same as during a non-private birth, and your support will come from the midwives. Women often choose to take a private doctor for: an elective C-section, breech position that the woman would like to attempt vaginally, a high-risk pregnancy, and women with other health issues. As in most other hospitalizations, the woman must pay the doctor separately, but all other hospital costs are completely covered. There are two natural birthing rooms in Laniado Hospital. A woman must register by week 32 and if she meets the criteria she may come to deliver in the center. This is a free service. However, she is not guaranteed a place and will be supported by the midwife on call. A woman may hire a private midwife for 4,700 NIS, and meet with the midwife beforehand as well as have preference for the natural birthing room. This paid private midwife option also exists at Ma’ayane Hayeshua Hospital. Meir and Lis Hospitals also have this ‘nested’ model, where if the woman is considered low risk when she comes in during labor, she may choose to deliver in one of the ‘natural birthing rooms’ depending on availability. Hadassah Hospital – Ein Karem offers a birthing center option, where the woman meets with one of the midwives beforehand, and could be delivered by any one of the midwives in the group. This service costs 3,800 NIS. A planned caesarean just means that the woman is not in labor when she chooses to have a c-section. The most common reasons for a doctor to suggest a c-section are: baby is breech [head is up], the baby is thought to be overly big, as in some cases of gestational diabetes, or the woman has already had two or more caesarean deliveries. You do have the right, as in all medical suggestions, to say no and investigate further, with a second opinion as to whether you choose a caesarean delivery. Coverage: if you choose an elective c-section for medical reasons, this is covered under the healthcare system. If you want to choose the doctor that will perform the operation, you must pay the doctor separately, but all other hospital expenses are covered. Unplanned c-sections happen for a variety of reasons during labor, the most common being that the labor is not progressing, or the baby and/or mother are in distress. Often, these decisions are made quickly and in a period of crisis. In an unplanned c-section, the father may not be allowed into the operating room. Make sure to have additional support people around you in that situation. All costs of these operations and aftercare for the newborn are all covered. Thank you for writing this. Puts some More Clarity on The subject And gives me a feeling Of being a little More in control.